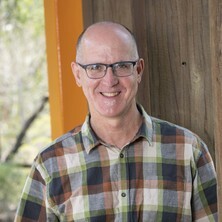 Mark Moran is Professor and Group Leader of Development Effectiveness at the Institute for Social Science Research, UQ’s flagship unit for applied social science research and one of the largest social science research institutes in Australia. Professor Moran has a unique background that includes both social science research and applied development projects, in a career spanning academia, non-profits, government and consultancy. His cross-sectoral career is a strength for his current research, which focuses on the science of development effectiveness—toward forging new collaborations between academia and development practice. His work traverses Indigenous and international development contexts, including Aboriginal Australia, Native America, Bolivia, China, Papua New Guinea, Timor Leste and Lesotho. Additionally, he has comprehensive research and practical experience in complex and politicised development contexts, including project and stakeholder management, governance, public finance management, participation, community planning, social housing, water and sanitation. Professor Moran actively translates his research and professional experience through innovative teaching at UQ. He is Program Director for the Master of Leadership in Global Development (MLGD), Australia’s only coursework master’s program that combines theory, leadership, management and business acumen. He is also the Academic Lead of Australia’s first MicroMasters® credential. The Leadership in Global Development MicroMasters is an innovative online course series delivered through edX, which forms a core component of the MLGD. He also delivers a professional development short course, Advanced Place-Based Development Approaches, to industry, NGO and government partners. Among his publications is Serious Whitefella Stuff: When Solutions Became the Problem in Indigenous Affairs, a popular text that applies international development practices to local Indigenous communities in remote Australia. Moran, Mark (2018, November 23). In the post-APEC scramble to lavish funds on PNG, here’s what the country really needs. The Conversation, . Moran, Mark (2018, November 06). Mobile money: An opportunity for development and governance in rural Papua New Guinea. Center for Global Development: Commentary and Analysis Blog, . Moran, Mark Serious whitefella stuff: when solutions became the problem in Indigenous affairs. Carlton, Victoria, Australia: Melbourne University Press, 2016. Moran, Mark (2014) Bourke Housing Project Evaluation: From Houses to Homes. , Bourke Aboriginal Community Working Party, Murdi Paaki Regional Enterprise Corporation. Moran, Mark (2016). Closing the gap is proving hard, but by working developmentally we can do better. In The Conversation (Ed. ), Ideas for Australia: 10 big issues for election 2016 and beyond 1 ed. (pp. 102-105) Sydney, NSW, Australia: Future Leaders. Hutchins T and Moran M (2011). Not another service provider: partnering for sustainability. In Annual Program Review 2010 (pp. 13-16) Melbourne, VIC, Australia: World Vision Australia. Moran, Mark (2018) The courage to reform: Fixing the Commonwealth’s Indigenous policies. Griffith Review, 60 . Moran, Mark (2016) The wicked problem of alcohol management. Inside Story, . Moran, Mark (2016, March 04). How community-based innovation can help Australia close the Indigenous gap. , . Moran, Mark and Corpus, Gemina (2014) Adapting development practice to indigenous contexts. Development Bulletin, 76 79-83. Moran, Mark (2013) Mothers know best: managing grog in Kowanyama. Griffith Review, 1 40: 196-209. Moran, Mark and Sullivan, Patrick (2012) The answer to Olga's question?. On Line Opinion, . Moran, Mark and Porter, Doug (2012) Breaking through bureaucracy in Indigenous governance. The Drum, . Moran, Mark (2012, July 06). The 30-year cycle: indigenous policy and the tide of public opinion. , . Moran, Mark (2012) Bridging the gap of Indigenous development. The Drum, . Moran, Mark (2012) A different inequality. The Drum, . Moran, Mark (2009) On questioning the “viability” of remote Aboriginal settlements. Crikey, . Moran, Mark (2009) What job, which house? : Simple solutions to complex problems in indigenous affairs. Australian Review of Public Affairs (Digest), 1-13. Moran, Mark (2009) The viability of 'Hub' settlements. Dialogue, 29 1: 38-51. Moran, Mark (2008) Dreaming the great Australian dream. Architecture Australia, 97 5: 77-78. Moran, Mark (2008) Neoliberalism and indigenous affairs: "Development Beyond Neoliberalism: Governance, Poverty Reduction and Political Economy" by David Craig and Douglas Porter New York, Routledge, 2006 (352 pp). Australian Review of Public Affairs, . Moran, M. F. (2003) An evaluation of participatory planning at Mapoon Aboriginal community: Opportunities for inclusive local governance. Australian Aboriginal Studies, 2 72-84. Moran, Mark (2002) The devolution of indigenous local government authority in Queensland: Opportunities for statutory planning. Australian Planner, 39 2: 72-82. Moran, M. F. (2000) Housing and health in indigenous communities in the USA, Canada and Australia: The significance of economic empowerment. Aboriginal and Torres Strait Islander Health Bulletin, . Leonard, D, Beilin, R and Moran, M (1995) Which way kaikai blo umi? Food and nutrition in the Torres strait. Australian Journal of Public Health, 19 6: 589-595. Moran, Mark (2016, July 08). Structures must change to allow Indigenous development. SBS, . Moran, Mark (2016, February 06). When solutions become the problems in Indigenous affairs. The Sydney Morning Herald, . Moran, Mark and Porter, Doug (2012, June 09). Fix the system and the rest follows. The Australian, . Moran, Mark (2007). The interethnic practice of local governance in Aboriginal settlements in desert Australia. Desert Knowledge CRC: The working paper series 12, Australian Government Cooperation Research Centres Programme, Desert Knowledge CRC. Moran, Mark F. (2006). Practising self-determination: Participation in planning and local governance in discrete indigenous settlements PhD Thesis, School of Geography, Planning and Architecture, The University of Queensland. Note for students: Professor Mark Moran is not currently available to take on new students.